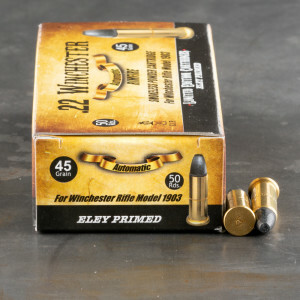 22 Winchester Automatic ammunition, also known as 22 Winchester auto, or the 22 Win Auto, is a round that was developed in 1903 for the Winchester 1903 semi automatic rifle. The 22 Winchester auto was never chambered in another firearm and has quickly become a favorite of gun collectors and Americana collectors. Today, the semi automatic rifle remains popular among a cult following always looking for a new run of 22 Winchester automatic. The round was quite popular at the time, derived to ensure the Winchester 1903 rifle would function. Traditional 22 cartridges of the time utilized a filthy black powder that would quickly gum up the action of the Winchester 1903 rifles. The rifle’s tight tolerances demanded a clean firing round that would remain accurate, quiet, and low recoiling. Good price, friendly service when we had a shipping mishap to the wrong address.